Back in October we brought you the story of PA Hair who an a fundraising event in aid of Balbriggan Cancer Support Group. From 9am to 1pm on the day any service that was booked into the salon the proceeds would be donated to Balbriggan Cancer Support Group. 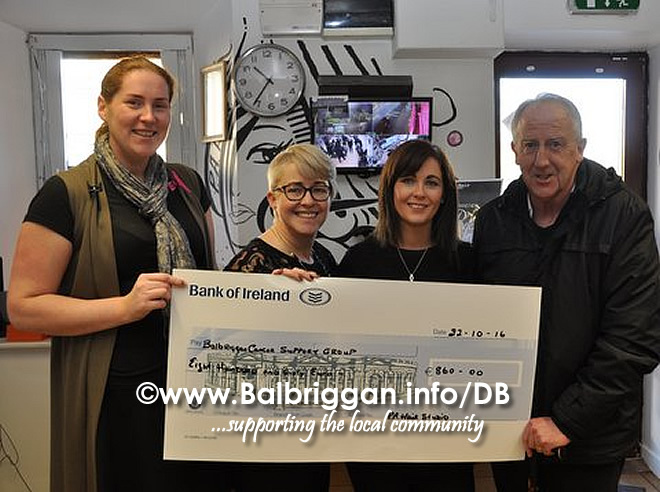 PA Hair presented Balbriggan Cancer Support Group with a cheque for €860 which will go a long way towards heling them with the services that they provide. Well done to Sharon, the stylists and all the customers and sponsors who supported the event. Click here for photos from the fundraising day.